The holidays are a wonderful time to relax, but not for Emily! Delicious – Emily’s Holiday Season has Emily working through the winter while also juggling a complex love life. 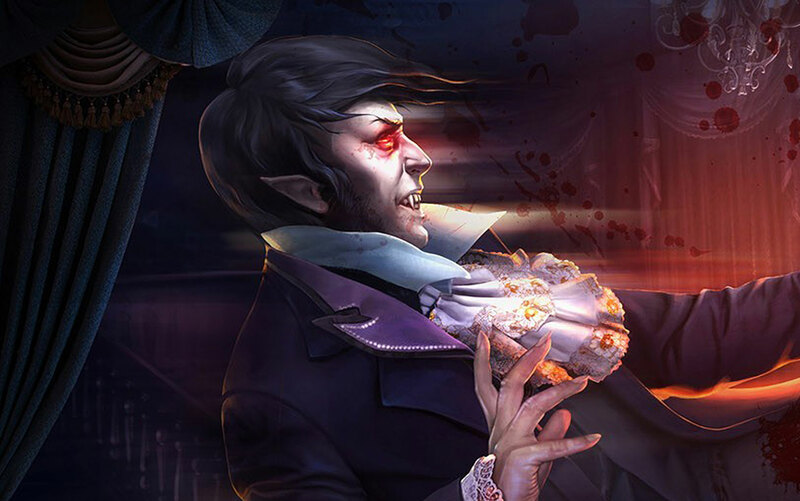 Which suitor she chooses is ultimately up to you, but there are far more important things to worry about like finding all of the Easter Eggs, Trophies and Mouse locations in the game. This walkthrough offers tips and tricks to help you obtain all achievements, extras and unlocks in every level as wells as a basic gameplay guide, hints and cheats. 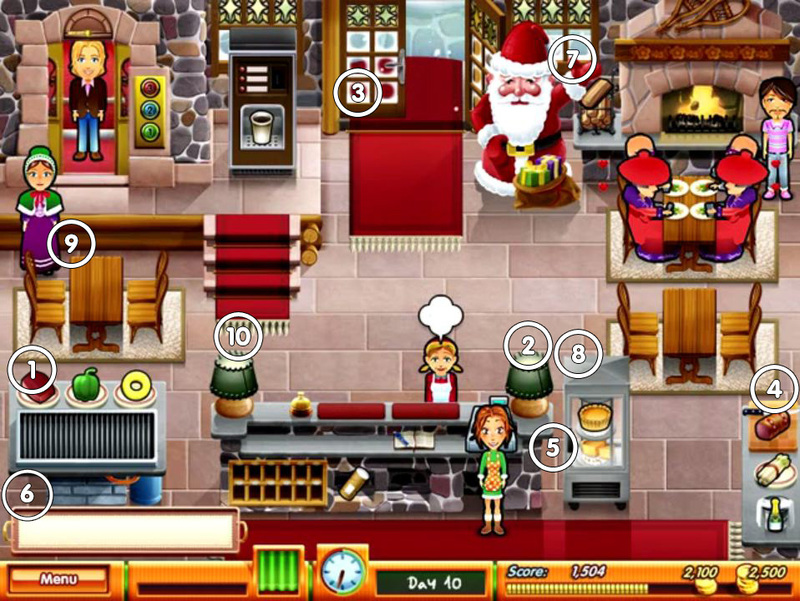 During preparations for a family holiday party hosted by the Snuggford Hotel, Emily is talked into managing the hotel restaurant to pick up some extra cash. Emily soon becomes involved in a love triangle, and the choices you make determine who she ends up with in the end. 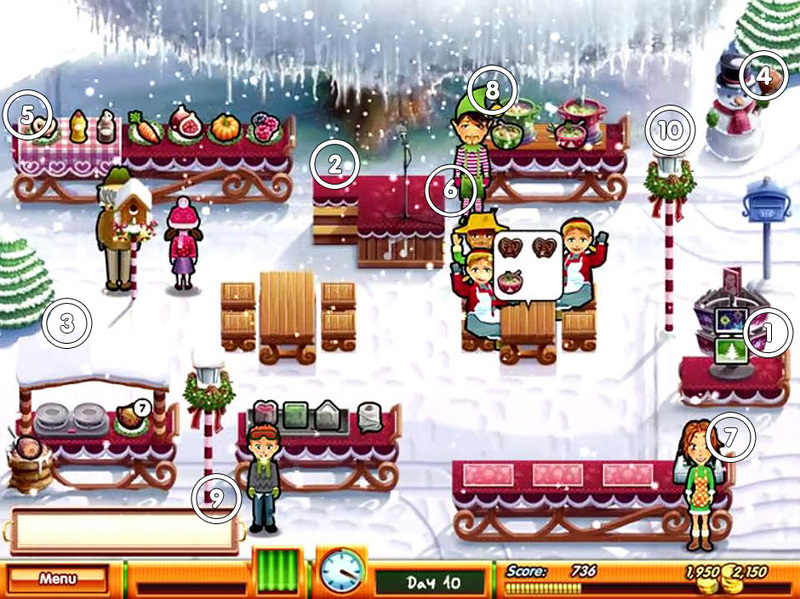 In Delicious – Emily’s Holiday Season, your goal is to help Emily keep customers happy while completing winter themed special challenges such as making snowmen and ice-skating. Each level begins and ends with a story line segment in which you meet new characters or catch up with Emily’s old friends and family from other Delicious games. There are three difficulty modes: beginner, normal and advanced. The default mode is normal, but you can change the difficulty at any time by accessing the settings button in the main menu. You can also adjust the volume of music and sound effects; however, because the sound effects often give clues to challenges, it is recommended to always keep the sound effects turned on. 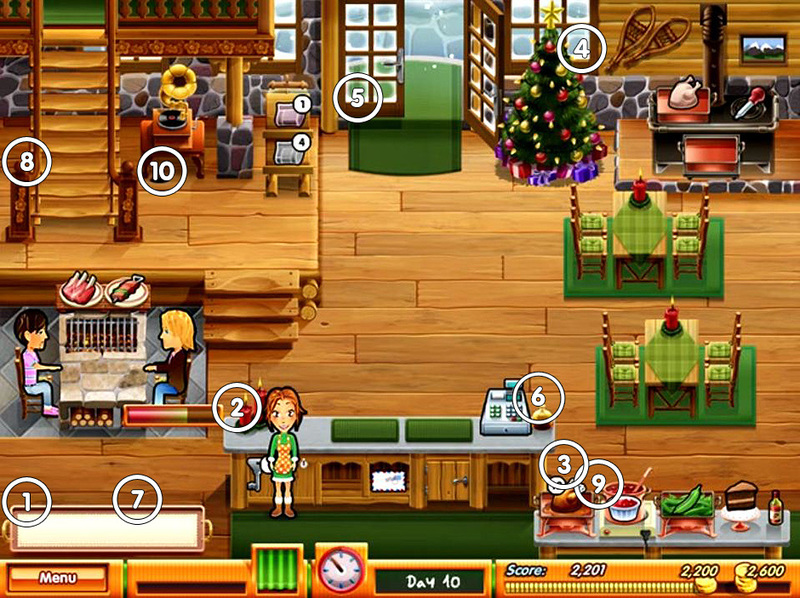 Every level consists of a day at Emily’s restaurant. There are 50 levels split across five different restaurants. Throughout Emily’s shifts, she must take customers’ orders, prepare and serve food, run the register and clean up after everyone. Customers who receive prompt service are more likely to leave larger tips, but patrons who feel neglected may walk out without even ordering. You can tell a customer’s satisfaction by whether or not they have hearts next to their heads; no hearts means someone is on the verge of walking out. Each level has a timer, and Emily must reach a minimum score before the timer runs out to progress to the next day. Every level also has a target expert score for players who desire a greater challenge. Preparing food starts out simple and becomes more involved as the game progresses. Some items require multiple ingredients, which must be combined in a specific order and then restocked. Other items must cook for a while before they can be served. New menu options become available at the beginning of some levels. Your goal to is to best manage your time and resources to optimize your service and therefore your score, so change up your menu often to experiment with different strategies. When customers leave, click their dishes to clear the table. If you don’t keep your tables clean, new customers might walk out. You can increase customer satisfaction by sending out an entertainer while you work on other tasks. Happy customers leave larger tips, so employ your entertainer as often as you can. Emily can spend her earnings on Francois’s Decorating Catalog, which carries items that improve customer satisfaction. Don’t horde your money; reinvest your profits to earn even bigger tips! Purchase every item available in the game to win the “Decorator” trophy. Each level begins with setting your menu for the day. Your choices are initially very limited, but your options quickly increase, so you must deploy an effective strategy to reach all of your goals. Some items have benefits over others: For example, some take less time to prepare, which allows for quicker service and bigger tips. Switch up your menu if you find yourself having difficulty beating a level. Every restaurant has a different clientele. You can view a level’s customer types in the menu. Identify each customer’s type to gauge their patience levels, tipping tendencies and dietary preferences. You can use this information to help you during busy times. For instance, you should always prioritize large tippers who have low patience before serving customers who have high patience. When serving orders, Emily can only carry a limited number of items on her tray. She gets access to larger trays as you progress. Click on items and hold down the mouse to drag them onto the tray. If you make a mistake, click on the item again to put it down. – For popular items that need to be cooked on the stove or grilled, start cooking a few right away to get a head start on serving big groups. – The number beside an item indicates the amount you currently have in stock. Every item has a maximum limit; try to never allow any item’s stock to fall below half the maximum limit so you don’t wind up in an emergency. – In levels that require fishing, berry picking, cooking turkey or baking cookies, start on these tasks first before things get busy. – For items that require stirring, taking your eye off the pot too long can result in a mess that you must clean up. This can set you back, so keep your eyes and ears out for pots that need to be stirred. – Items that are cooked on the grill or stove must be taken up as soon as they are done. Click on them before they burn to a crisp and you’re forced to start over. Just like in real life, never walk too far away from a hot stove! – During the levels that take place in the hotel, you can actually check out four customers at once thanks to hotel keys and mail. If you have two customers waiting for check out, wait a few seconds to see if other patrons come asking for their key or mail. This method can quickly and easily boost your score. 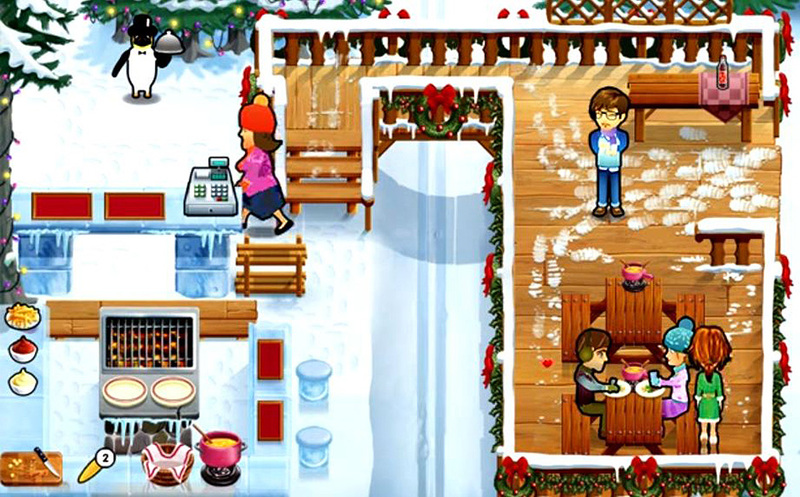 Like in previous Delicious games, every level in Emily’s Holiday Season contains a hidden Mouse. You have up to four opportunities to catch the Mouse by clicking on him when he appears. He will squeak right before he pops his head out of his hiding spot, so listen carefully. Catching the Mouse gives you 100 extra points, and catching all 50 Mice earns you the coveted “Pest Control” Trophy. Below are maps of each restaurant indicating where every Mouse can be found. The number beside each Mouse is the day it will appear. Ten Easter Eggs are hidden throughout the game. If an object looks particularly out of place, click on it to reveal a secret. 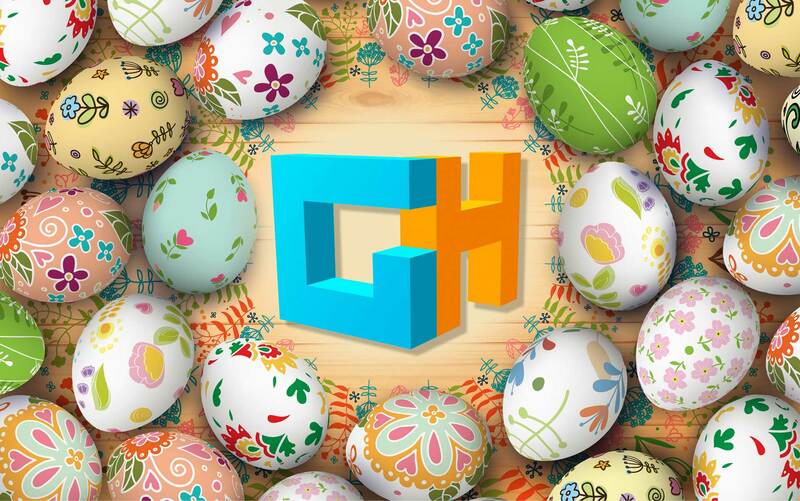 Most Easter Eggs are based off other GameHouse titles. Collect all 10 to win the “Perceptive Missile” Trophy. Here is a guide for where to find each Easter Egg. (Day 9) Coffee Cup – In the upper-right part of the screen. If you bought decorations, you may not see it, but if you drag your mouse over there during this level, the Easter Egg will reveal itself. (Day 6) Firefly – In the elevator on the right side of the doors. (Day 3) Tea Platters – Near the lower left corner by the cutting board. (Day 8) Crystal – Beneath the deck, front and center. (Day 4) Latte – In the barn beside the cow. (Day 7) Block – To the right of the gate’s entrance. You can win 17 Trophies in total by completing certain objectives in the game. Besides a warm and fuzzy feeling inside, Trophies give you fireworks to play with during the game’s end credits. Here is the full list of Trophies and what you must do to collect them. “The Hogger” – Have items left over when everything is fully stocked. “Quadruple Popper” – Score a quadruple payment combo. “The Heart Blow” – Choose who Emily falls in love with at the end of the game. It doesn’t matter who she picks. “Cash Combo Pop” – Achieve three payment combos back-to-back. “The Special Delivery” – Receive 100 deliveries. “Female Intuition” – Have a customer’s order fully prepared and on your tray before they actually order. The order must contain at least two items. “The Planner” – Set 10 actions in your que. Special Task – Remove all of the spiderwebs throughout the hotel restaurant by holding down the left mouse button and dragging the cursor back and forth over them. There are six webs total circled in the pictures below. Hint – Take advantage of guests with hotel keys to achieve triple combos when checking out customers. Special Task – Click on the seven spiders to get rid of them. Easter Egg #1 – Don’t forget to pick up the Camera. Special Task – Make 16 place cards and arrange them in the correct order at the long table. Mail – When you see the mailman arrive, click him to receive the delivery and have it transported beneath your desk. When someone comes asking for their mail, simply click on the mail, and then click on the customer. Prompt service earns you a tip as usual. 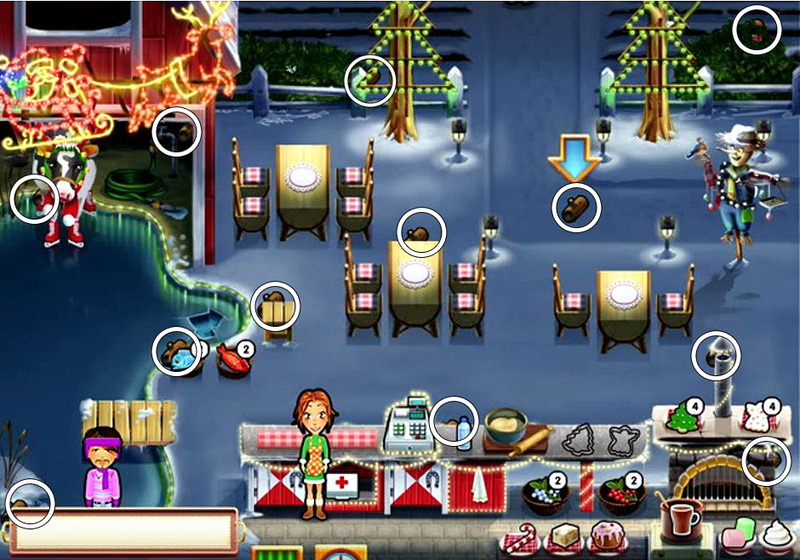 Special task: Many guests will come to the restaurant today, and you must speak one-on-one with each and every visitor. While this is challenging, doing so gives you bonus points and the “Great Listener” Trophy. Newspapers – Halfway through the day, newspapers will be delivered in bundles by the front door. Click on them to set up a newspaper rack, which can help keep customers distracted and happy. There are two newspaper types: red and blue. Blue newspapers only entertain patrons for a short period of time while red ones keep them engaged throughout their entire visit. Hint – Give newspapers to the children and the impatient woman to keep them occupied while you focus on other customers. Special Task – Clear the very large table while continuing to serve other customers. It takes Emily 100 seconds to clear the whole table. Special Task – Give the correct keys to the customers who ask for them. Special Task – Chase Richard around the entire restaurant six times. Special Task – Simply answer all of the interview questions. There are no wrong answers. Special Task – When the dance competition begins, three different colored panels will show up on the floor. Follow the patterns of panels lighting up by clicking on them to assist the dancers. Special Task – Emily must speak with Paul and Richard several times during her day. Paul and Richard each have a meter below them that will deplete if you ignore them, so take turns talking to each one to keep them from running out. Richard remains in the restaurant throughout the level, yet Paul disappears upstairs every now and then. Special Task – Finish building the snowman before time runs out. You must fill up the meter three times. Begin on this task early since it will take a long time to complete. Easter Egg – Look for the Star Shaped Christmas Cookie near the base of the lantern. Trophy – Click on all of the gifts surrounding Santa to unwrap them. 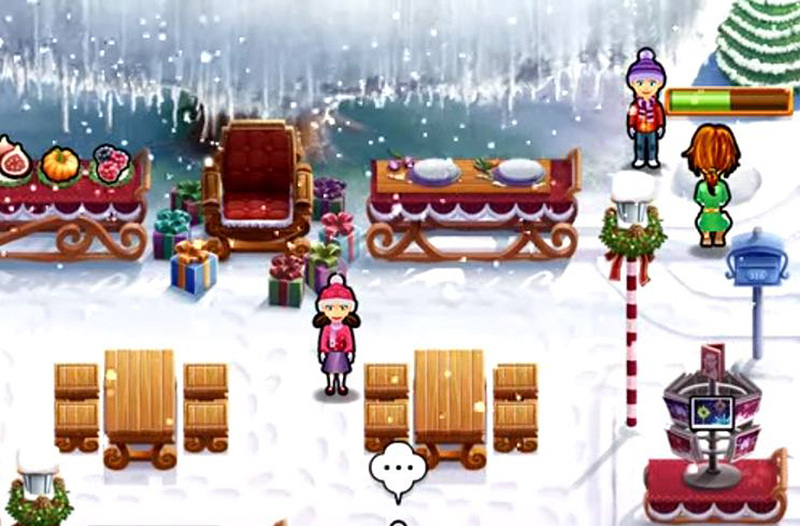 Be sure to do this in every level of Winter Fair to uncover the Santa’s Secret Trophy. Special Task – Continue working until the storm ceases. Special Task – Get Francois to put on the elf costume by chasing him around the fair six times and catching him. Special Task – Paul will get pelted in the face by snowballs throughout the shift. Wipe him off five times before day ends. Special Task – Interact with the dog six times during your shift. 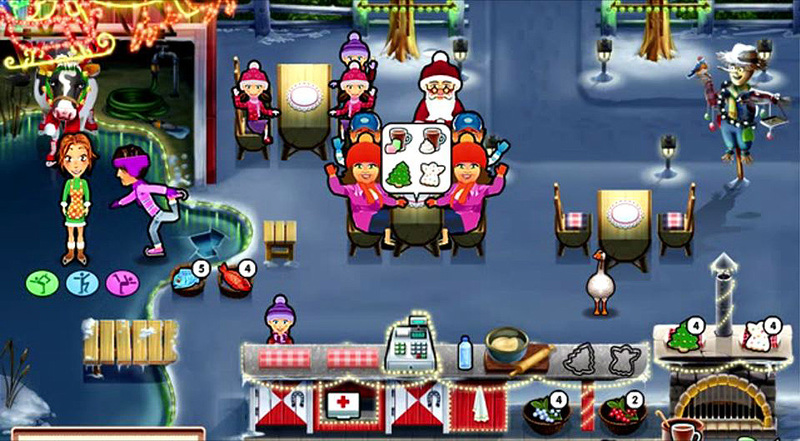 Santa – When you see a child sitting on Santa’s lap, click on Francois to take a picture to earn extra points. Special Task – Receive eight packages as soon as they arrive. Special Task – Locate all of the 12 Christmas cards scattered around the restaurant. Special Task – Don’t let any of the four candles go out during the shift. Listen for the tone indicating that the candle needs relighting. Special Task – When you hear someone singing, click on them to get everyone else to applaud. Do this for everyone who sings. Elevator Buttons – You are now responsible for controlling the elevator for customers. Can’t these people do anything on their own? If you take too long, potential customers could walk away and never come back. Special Task – Answer all of the questions that get asked of Emily. There are no wrong answers. Hint – Today is a beef-lover’s bonanza. Customers only order beef in this level. Firewood – Keep customers warm and happy by supplying adequate Firewood. When you see flames flickering and hear the tone, it’s time to add more wood to the fire. Special Task – Find the four missing articles of clothing, which are circled below. Special Task – Set Richard free by repairing the elevator by the end of the shift. Special Task – Receive seven packages as they are delivered. 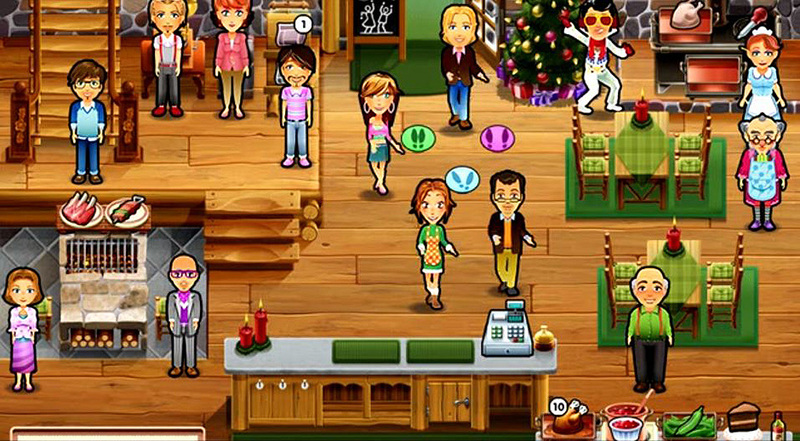 Special Task – Take the phone back from Angela by following her around the restaurant and catching her nine times. Special Task – Clean two very dirty rugs. Hold the left mouse button down and swipe the cursor across the rugs to scrub them. Each rug takes 100 swipes to remove all of the dirt. Easter Egg – Collect the Firefly Easter Egg from the wall near the upper-right side of the elevator door. Special Task – Scrub all nine footprints from the floor. Special Task – Walk 1000 steps during the shift to break in Mom’s shoes. Special Task – Answer Ludwig’s questions. There are no wrong answers. Easter Egg – Click on the Easter Egg, which is actually a Baby Penguin Egg hidden below the register. Fondue Pots – Filling the fondue pots at the end of every table is a great way to collect points. You earn 50 points for filling each pot plus an extra 10 points for pots filled before a customer sits down. 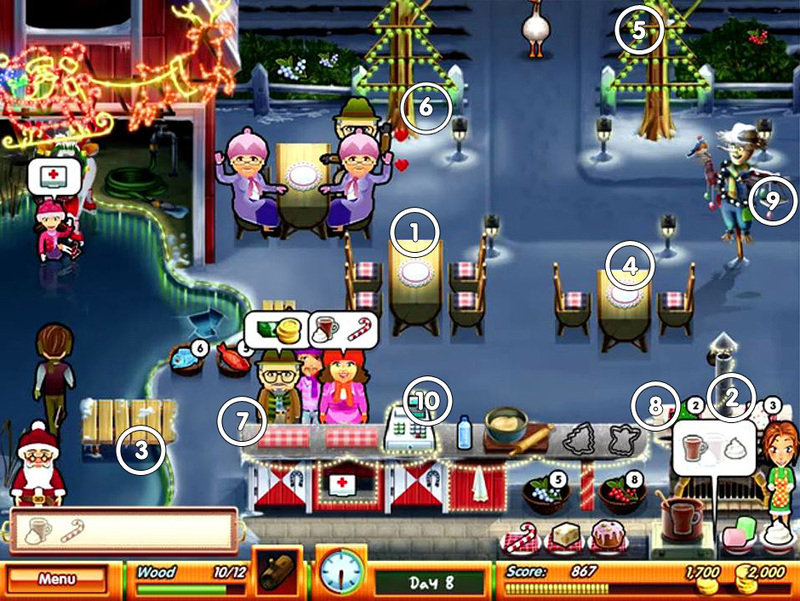 Entertainment – Starting in this level, you have Skeeter the Penguin to help you entertain guests. Skeeter is a former circus performer, so he knows how to sing and juggle. Send Skeeter over to entertain customers with low patience or keep a group occupied while you focus on the kitchen. Special Task – When you see Paul looking upset, click on him to cheer him back up. Do this eight times. Special Task – Cover up the six dirty spots with snow. Special Task – Find the six articles of ski equipment hidden throughout the restaurant, which are circled below. Easter Egg – Don’t miss the Tea Platters Easter Egg sitting in the lower right corner by the cutting board. Special Task – Make sure to speak with all visitors including Mom, Dad, Tashi, Paul, Angela and Francois during the day. Special Task – Serve all of the food to the men having a meeting within eight minutes. A meter will display your progress. Special Task – Receive six packages for Paul during your shift. Special Task – Click on each flagpole and wait for Emily to raise a flag. Do this for all five flagpoles. Special Task – Answer Paul’s questions. You will receive points regardless what your answers are. Easter Egg – Click on the Crystal Easter Egg hiding below the deck near the center of the screen. Special Task – Find all nine of the roses scattered about the restaurant. Their locations are circled below. First Aid Kit – Skaters who fall and hurt themselves will come asking for First Aid Kits. Keep them stocked under the counter to keep everyone safe and happy. Special Task – Hold down the left mouse button and swipe back and forth over the ice to clean off all of the dirt. There are six dirty spots, and each one requires 50 strokes to clean. Francois is blocking one dirty spot for most of the level. Save that one for last when you send Francois to clean tables. 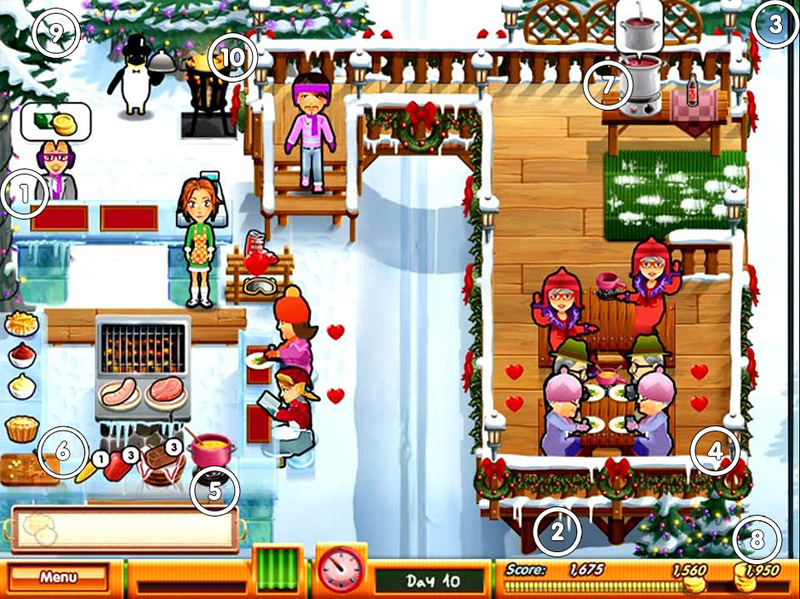 Special Task – Help Francois escape from the ice by repeatedly clicking the left mouse button over the ice blocks. There are six sections of ice that must be broken in total. Special Tasks – Talk to every friend and family member who comes in to see Emily today. Special Tasks – Don’t let any of braziers burn out during service. When you hear the tone and see the braziers flashing, relight them as quickly as possible. Easter Egg – The Latte Easter Egg is right beside the cow in the barn. Special Tasks – Warm up in the barn nine times during the shift. 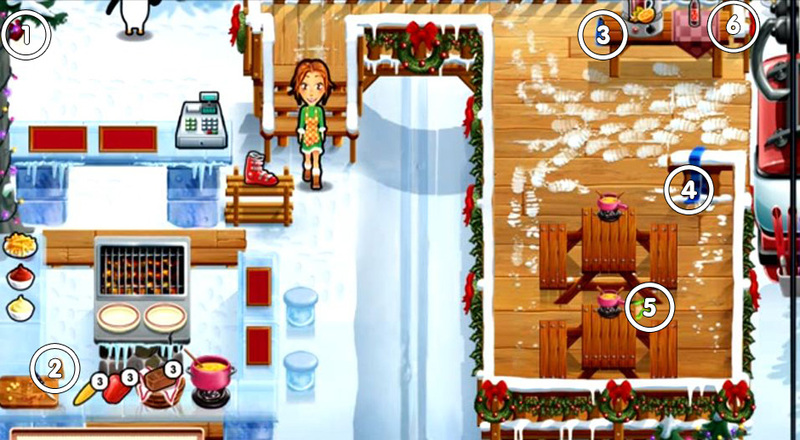 During this level, you must travel between inside and outside to keep warm while serving customers. Note the meter on the bottom left of the screen that depletes when Emily gets cold. If the meter runs out, Emily will be frozen in place for a brief while. Special Tasks – Successfully learn and perform the skating routine. At certain times during the day, time will stop and Emily will appear in the skating rink with Francois where there are three circles containing different skating poses. Memorize the order in which the circles light up, and then click on the circles in that order to perform the routine. 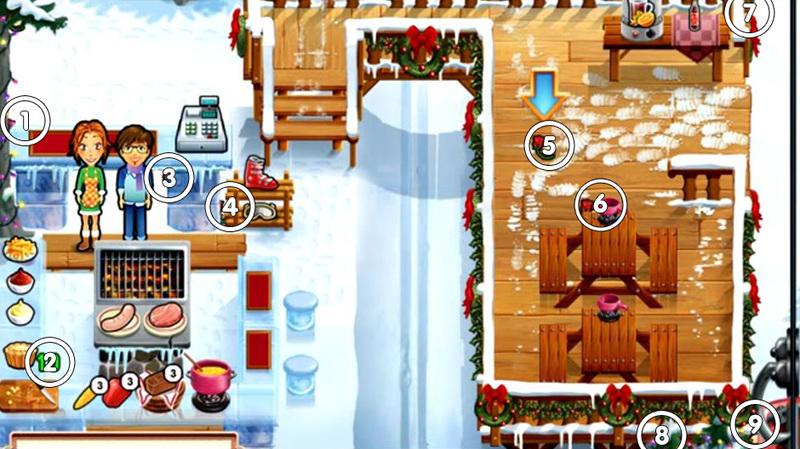 Special Tasks – Cover up the four patches of ice with snow. 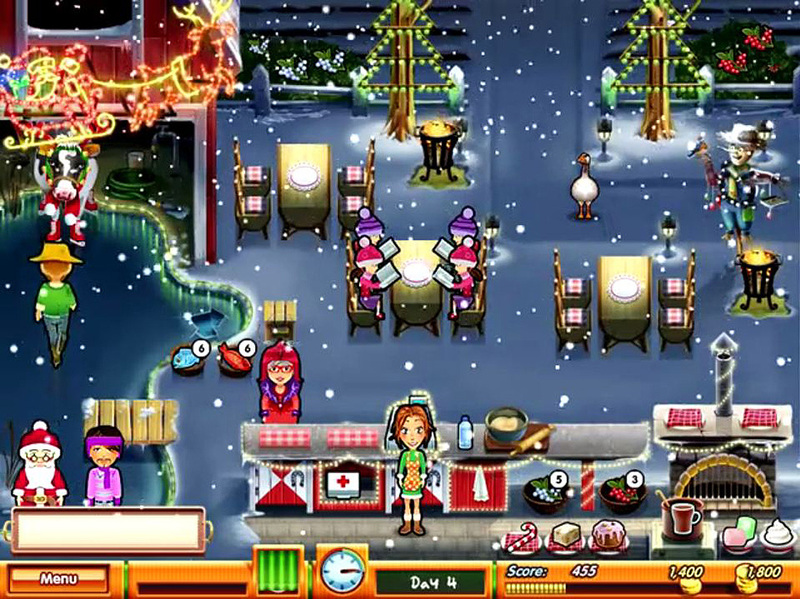 Easter Egg – Click on the snow-covered block underneath the Christmas tree lights to the right of the gate. 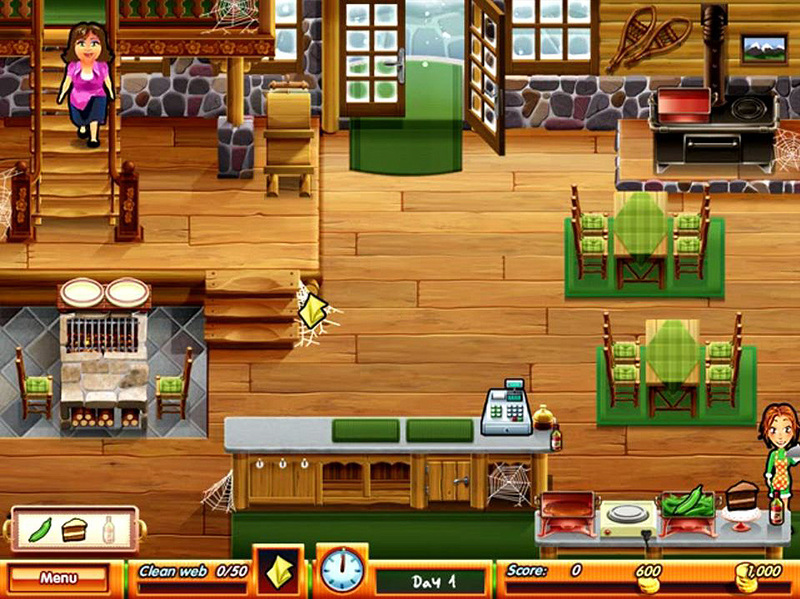 Special Tasks – Find all of the firewood. There are 12 pieces, which are circled below. 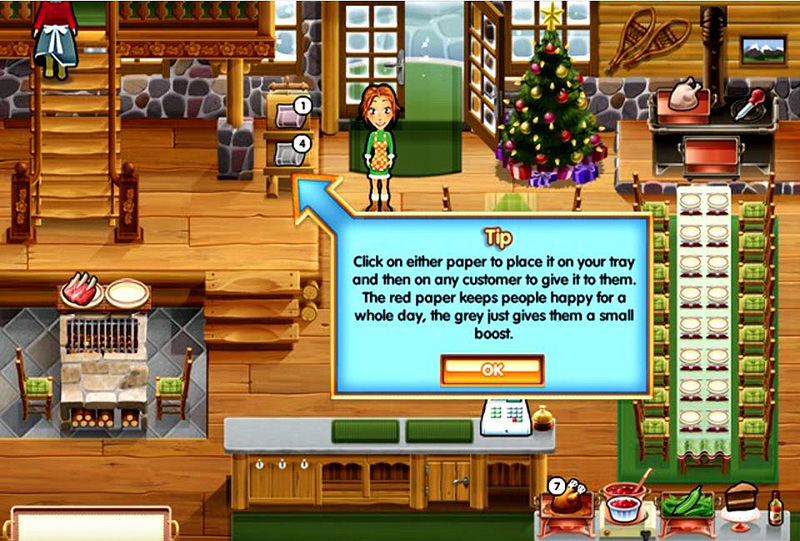 Special Tasks – Click on the tree to decorate it between serving your customers. Decorate the entire tree before time runs out. 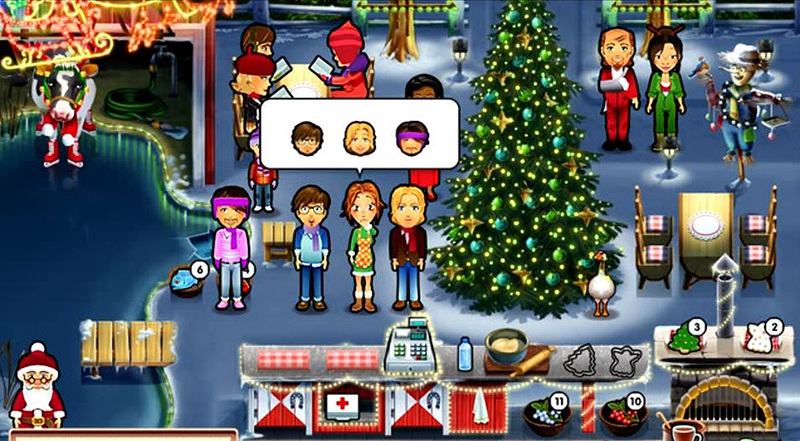 Special Tasks – Talk to all of Emily’s friends and family who come to visit during this level including Uncle Antonio, Mayor Maggie, Francois and Elvis. You have one last choice to make. Which of the three men who have professed their love for Emily should she choose? Fortunately, this ending is totally up to you, so pick whoever you like best. You will get a fireworks show for each Trophy you collected before the credits roll. Stick around until the end to witness a funny scene. Now you can go back to collect any items you missed or complete unfinished challenges. 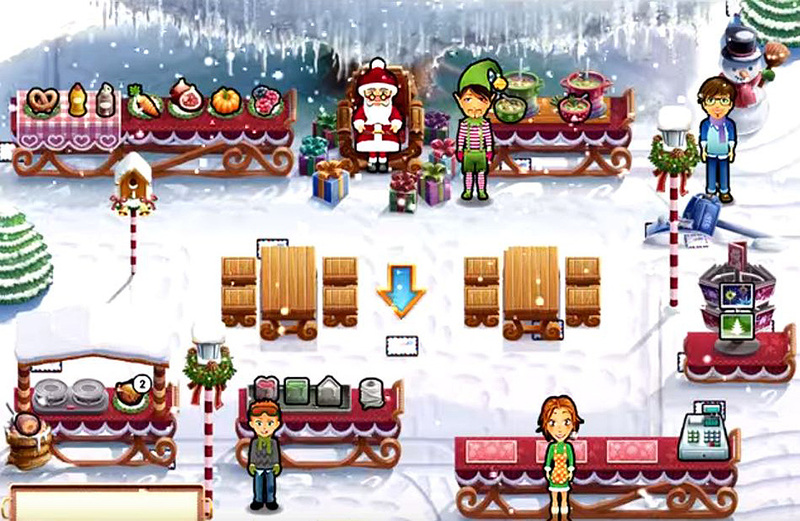 If you’re stuck in a level, watch this Youtube walkthrough for Delicious – Emily’s Holiday Season for more in-depth help. Congratulations on completing Delicious – Emily’s Holiday Season! Next, try some other titles by Gamehouse like Delicious – Emily’s Hopes and Fears and Red Riding Hood – Star-Crossed Lovers. 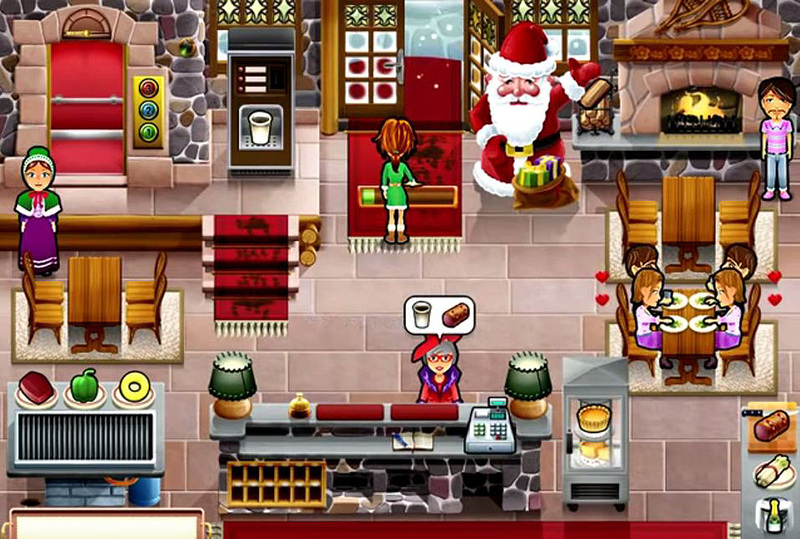 The Delicious – Emily’s Holiday Season Walkthrough is meant as a guide and does not contain cheats, hacks or serials.